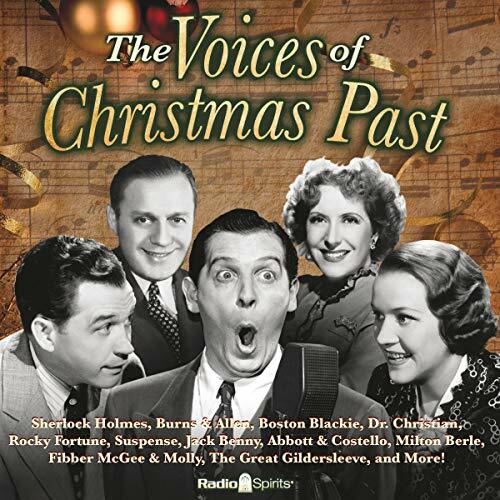 Spend your yuletide with the greatest stars of radio's Golden Age! Trim the tree, wrap the presents, and deck the halls as festive broadcast favorites like Jack Benny, Burns and Allen, Abbott and Costello, and The Great Gildersleeve keep you entertained! Episodes Include: Sherlock Holmes: The Night Before Christmas 12-24-45; Tales of the Texas Rangers: Christmas Present 12-24-50; Burns and Allen: Playing Santa Claus 12-21-43; Gracie's Christmas Party 12-25-47; Nick Carter, Master Detective: Nick Carter's Christmas Adventure 12-25-43; Boston Blackie: Stolen Rings at Christmas 12-22-48; Dr. Christian: Danny Gets Married 12-20-38; Rogers of the Gazette: A White Christmas in Illyria 12-23-53; Rocky Fortune: The Plot to Murder Santa Claus 12-22-53; Suspense: Dog Star 12-22-57; The Jack Benny Show: Trimming a Tree 12-24-44; Jack Carson: Kid's Record 12-18-46; Abbott and Costello: Lou's Christmas Party 12-20-45; Milton Berle: A Salute to Christmas 12-23-47; Fibber McGee and Molly: Early Christmas Presents 12-19-44; Judy Canova: A Quiet Christmas Party 12-21-46; The Great Gildersleeve: Leroy Wants a Motor Scooter 12-18-46; Honest Harold: Children's Christmas Party 12-20-50; Family Theater: Crossroads of Christmas 12-17-52; Amos 'n' Andy: Andy Plays Santa Claus 12-23-51. ©2012 Audio programs licensed through series rights holders. ©℗ 2012 RSPT LLC. All rights reserved. For home use only. Unauthorized duplication prohibited. (P)2012 Audio programs licensed through series rights holders. ©℗ 2012 RSPT LLC. All rights reserved. For home use only. Unauthorized duplication prohibited.